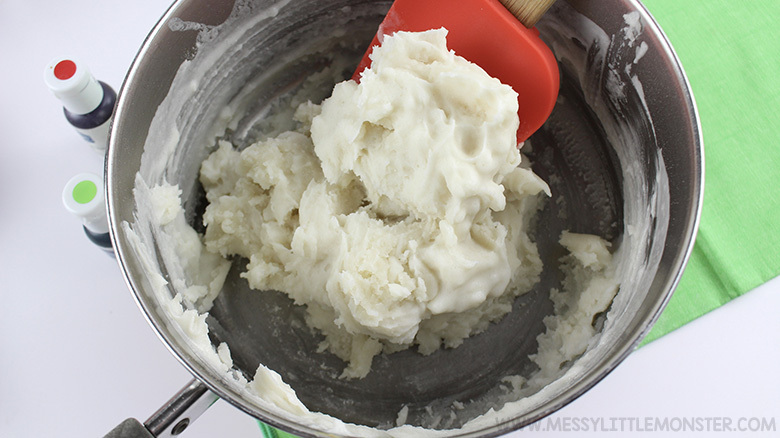 This playdough recipe is the PERFECT Christmas playdough for toddlers and preschoolers! 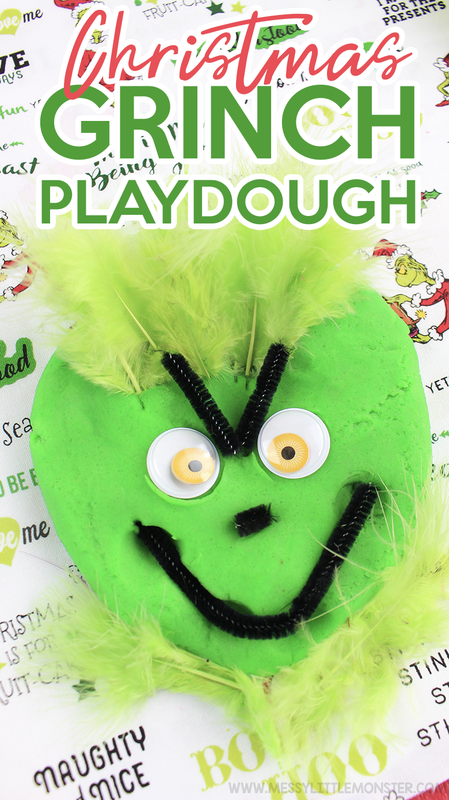 You will have hours of fun with this Christmas Grinch playdough. It's perfect for this time of year and gives toddler and preschoolers time for sensory and fine motor play. 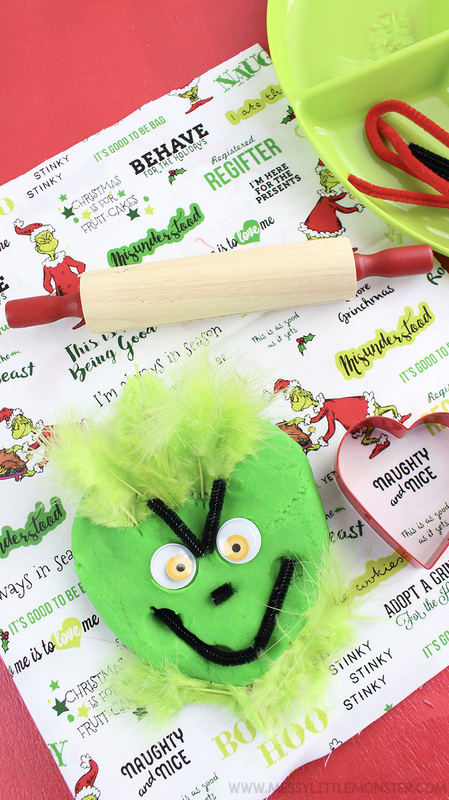 Just follow the step by step directions below to make your own Grinch playdough! For even more playdough fun, check out our edible playdough, snowman playdough, and even this Christmas tree playdough! 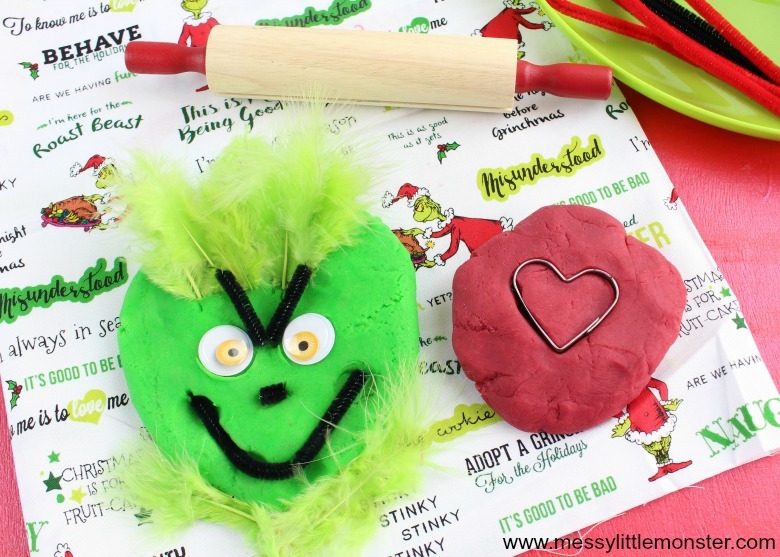 Grinch playdough would make a GREAT activity for in the classroom or for a holiday party or playdate. 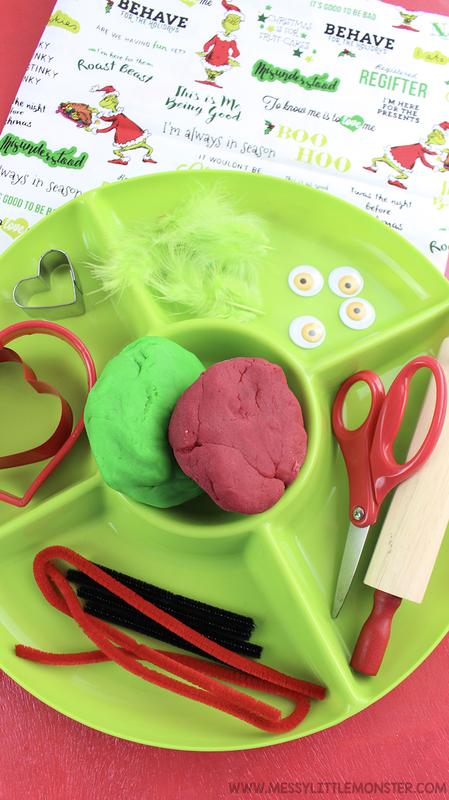 This playdough recipe is the PERFECT Christmas playdough to keep kids occupied and engaged. 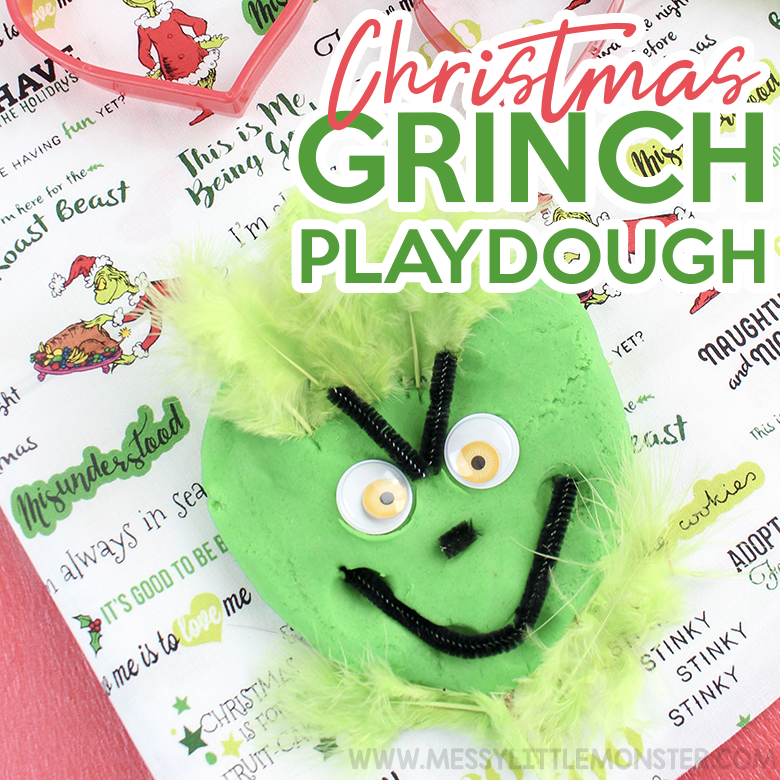 Just scroll down below to see how to make your own Christmas Grinch playdough! 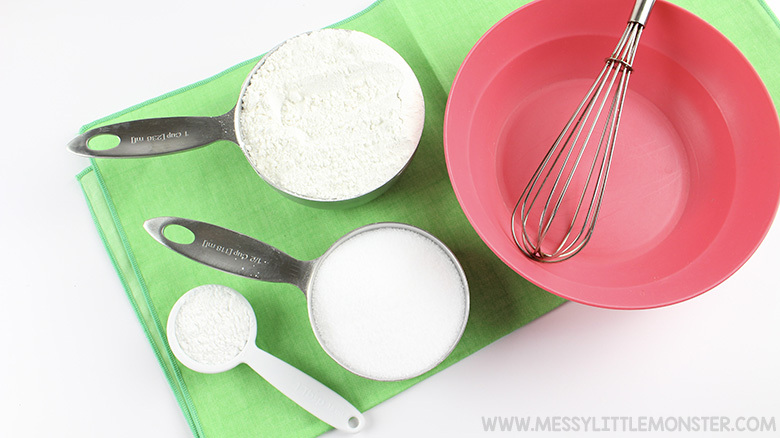 Before you get started, make sure to gather up all your ingredients for making your playdough! This just makes the process sooooo much easier. 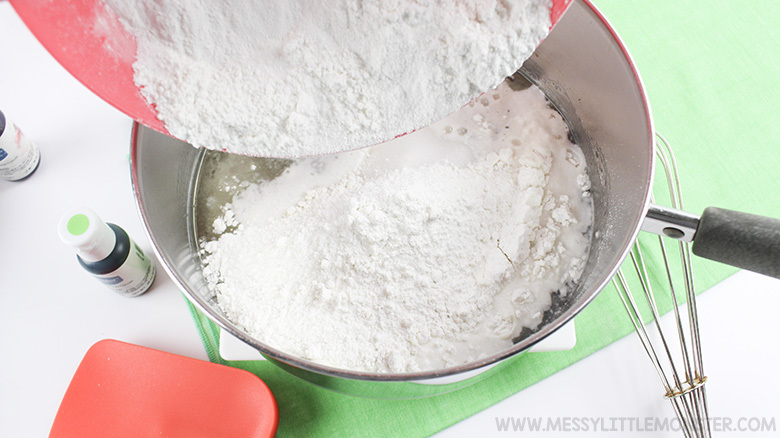 To get started, add the flour, salt, and cream of tartar in a mixing bowl and whisk to combine. Add the warm water and oil to a medium saucepan and stir well. Slowly pour half of the mixture into the water and whisk to combine. 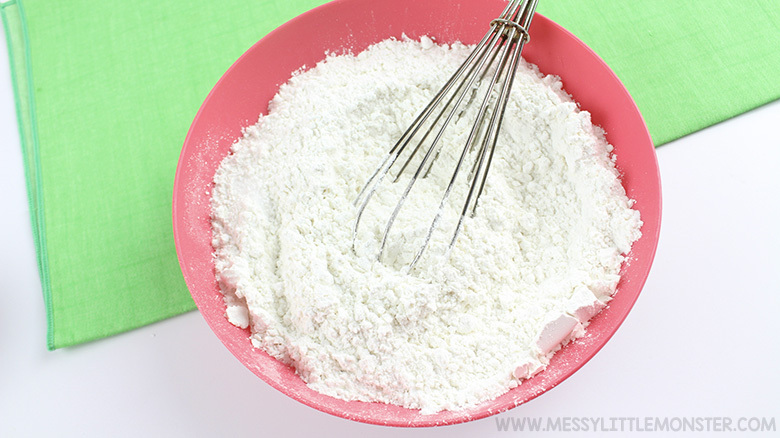 Add the remaining flour and whisk until lumps have disappeared. Next, place the saucepan on the stovetop over medium heat and stir constantly until a thick lump of dough forms, much like lumpy mashed potatoes. Remove from heat and allow to cool for 5 minutes. Divide the dough in half and add 4-5 drops of green food colouring on top of one of the balls of playdough. Place in a ziplock bag, seal, and have your preschooler or toddler help knead the bag for 5 minutes to distribute the colour without mess. 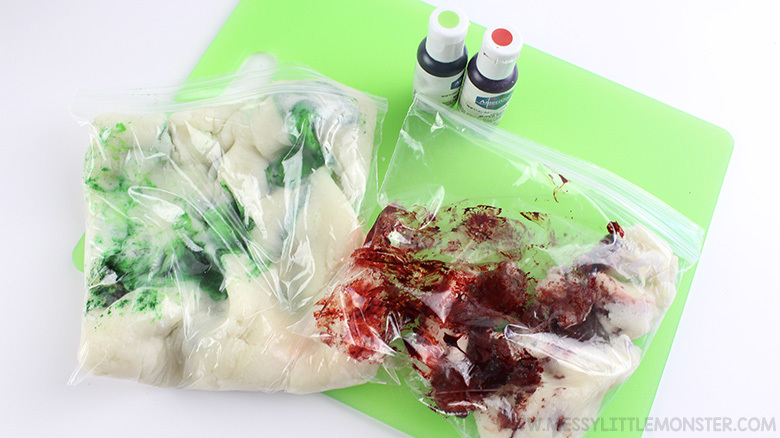 Repeat the same process with your remaining dough using red food colouring. Now that you have made your playdough, it's time to engage in some play! 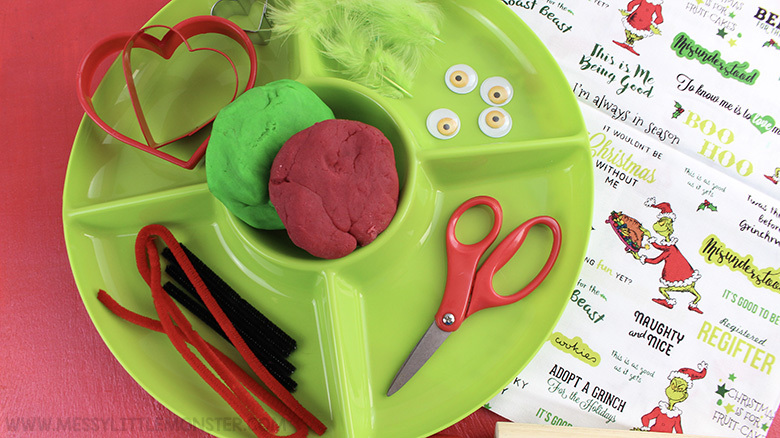 Get out your sensory/fine motor supplies and have some fun with your grinch playdough. You can use a cookie cutter or pipe cleaners to form hearts, green feathers for the top of the head, black pipe cleaners for nose and mouth, as well as other supplies for fun festivities! Let the kids imaginations run wild and enjoy playing with these brightly coloured playdoughs! Just be sure to store them in an airtight container when not in use. Here is just one example of how the kids could use the supplies to make their own playdough Christmas Grinch. I love how the pipecleaner eyebrows make the Grinch look so cross! 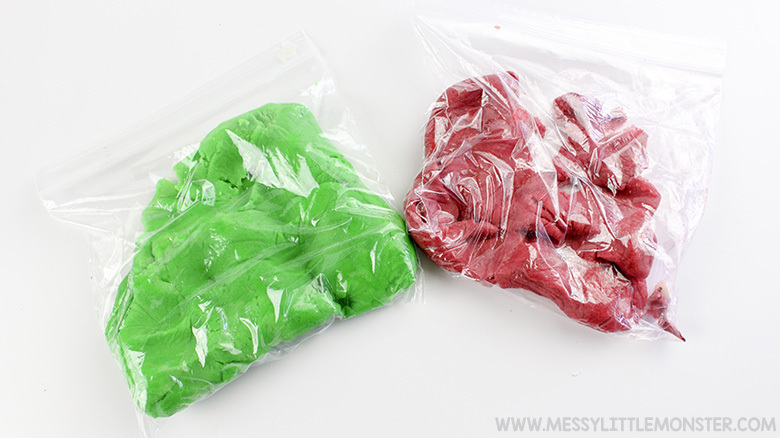 Your toddlers and preschoolers will LOVE this Christmas playdough recipe! It's perfect to go along with the Christmas Grinch book and movie and it's sooooo much fun for getting into the spirt of Christmas. It's great sensory and fine motor play too!